« JibJabbing on Jimmy Fallon with Weird Al! You Got Your JibJab in my Facebook! Huzzah! We’ve been building up to this moment for months and now we’re happy to announce that JibJab pictures and videos have hit the Facebook Gift store, allowing the world to oh-so-easily post videos from our massive library to your friends Facebook walls on birthdays, holidays or whenever! You may have read about it last week in Wired or the New York Times, as Facebook rolled it out to small groups of their users at a time. 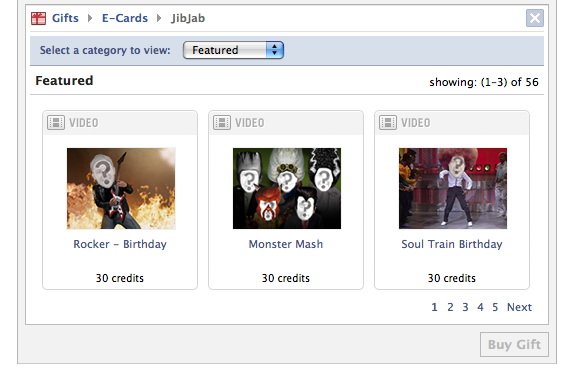 JibJab members will continue to get first word of new content as well as the ability to download and share via Facebook, while the Facebook option will be the best way to make one card or dance at a time using Facebook credits. In other words, JibJab.com is all you can eat, while Facebook will be one entrée at a time. Check Facebook’s FAQ and their blog for more information. This entry was written by paulhanges and posted on October 28, 2009 at 4:27 pm and filed under Facebook, Partners with tags Facebook. Bookmark the permalink. Follow any comments here with the RSS feed for this post. Trackbacks are closed, but you can post a comment.